Jupiter Icy Moons Orbiter - Solar System Planets And Moons Section. 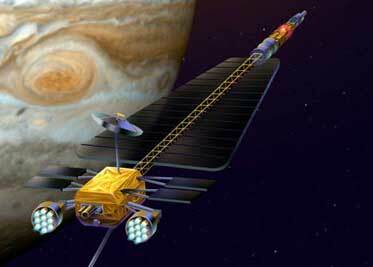 The Jupiter Icy Moons Orbiter would travel to the Jovian system. Quasars Come From Stable Homes. Quasars are some of the brightest and most distant objects ever observed, and Astronomers used to believe they only existed inside giant or disrupted galaxies, with supermassive black holes relentlessly consuming matter at their cores. But new research using the Gemini Observatory in Hawaii shows that they live in some of the more boring Galaxies in the Universe. Under the current theories, the powerful twin 8-metre Telescopes should have found enormous Galaxies in chaos, but they didn't. Only one Galaxy could actually be detected, and it wasn't much different from our own Milky Way galaxy. Rosetta spacecraft Focuses on LINEAR. The European Space Agency's Rosetta spacecraft is scheduled to meet up with Comet 67P/Churyumov-Gerasimenko in 10 years. It'll get to do some science before then, however, starting with Comet LINEAR, which is 95 million kilometres away (59 million miles). On April 30, Rosetta took a photograph of the Comet using its OSIRIS camera system, which was already scheduled for commissioning on that date. Rosetta studied the Comet in different wavelengths, from ultraviolet to microwave, and took a high resolution image in blue light. To celebrate Cassini's arrival at Saturn, the imaging team is going to be releasing a new photograph every day detailing some different aspect of the planet and its moons until the spacecraft enters the system in July. The latest photograph was taken on May 10, and is of swirling bands of turbulent clouds in Saturn's atmosphere. It was taken when Cassini was only 27.2 million km (16.9 million miles) away from the planet. Astronomers with the Harvard-Smithsonian Center for Astrophysics have found the heaviest star ever seen - 80 times the mass of our Sun - and it's got a twin. Located 20,000 light-years from Earth, the two massive stars in WR 20a go around each other every 3.7 days. These two stars are very young, probably only 2-3 million years old, and highly unstable. It'll only be a few more million years before they explode, one after the other as supernovas. Progress Launches to Supply Station. An unmanned Soyuz rocket launched a Progress cargo spacecraft towards the International Space Station on Tuesday. It lifted off from the Baikonur cosmodrome at 1234 UTC (8:34 am EDT), and placed the spacecraft into the proper orbit a few minutes later. Progress 14P is carrying propellant, oxygen, air, and water, as well as 1.2 tonnes of dry cargo, like food and equipment. The spacecraft will reach the station on Thursday.